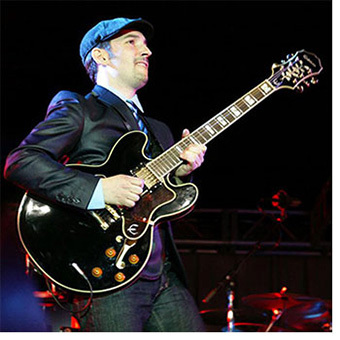 Matt Marshak is a unique performer with a sound that blends jazz, funk, soul, blues, chill, world music, and neo-soul. His audience has a very rare age range from college age kids craving some fresh funky grooves to baby boomers who love the maturity and dynamics of his writing and live shows. He has opened for and shared the festival stage with artists such as Spyro Gyra, Richard Bona, Dave Koz, Mose Allison, Boney James, Alex Bugnon, Eric Benet, Earl Klugh, Stanley Jordan, and Nick Colionne among other greats. He has also headlined his own shows in the USA and Europe. Epiphone's Don Mitchell recently spoke to Matt about his project Family Funktion, his Epiphone Sheraton and more. I know that you grew up in a musical family. Do you feel like that gave you an advantage in your musical career? Growing up with an older brother who was a drummer was a blessing. By the time I declared my passion to pursue guitar as a career, my parents were already broken-in by my brother! In all seriousness, I had a chance to watch dozens of bands rehearse at the house, and many great guitarists from New York often stopped by. I would pull up a chair and listen, check out their gear, and I made a lot of mental notes and asked a bunch of questions. As I got older I had a chance to sit in and jam and ultimately join the groups. It was mostly rock, pop music at the time. It gave me a great foundation and working knowledge of music and guitar playing. Other than those who dropped by, who were your earliest influences as a guitarist? My earliest influences were players such as Joe Satriani, Jimi Hendrix, B.B. King, and The Edge. Mostly rock, pop, blues players. You're project, Family Funktion was recently released to critical acclaim. Tell me about the process of recording this project. Recording Family Funktion was a unique process. Most of the tracks were recorded live with the bass, drums, and guitar at Secret Sound in Baltimore, and Persico Studios in New York City. Carl Anderson on drums, Kenny Harris on bass. A lot of the keys were added afterwards. I sent the files to Benjie Porecki who has a real Hammond and Fender Rhodes in his personal studio. I brought my laptop to Rodney Williams' home studio and added some keys there, too. I did have a track produced by Carl Burnett whose credits include Larry Carlton, Robben Ford, and Boney James among other greats. Did you use your Epiphone guitars on this project? Yes, I used my Epiphone Sheraton on nearly all the tracks. It has the perfect sound for my ears. It can be jazzy, funky, and bluesy. You have been playing Sheratons for quite some time. What is it you like about the Sheraton? I've been using Epiphone Sheraton's for about 10 years. I first came across one when I grabbed a guitar off the shelf at a music store to test an amp out. I soon forgot about the amp and was completely captivated by the sound, feel, and look of the Sheraton. It had an airy and jazz tone that I had never heard before. The sounds are quite diverse too. Great jazzy tones, super funky sounds, and it can even chirp out some fat rock leads. 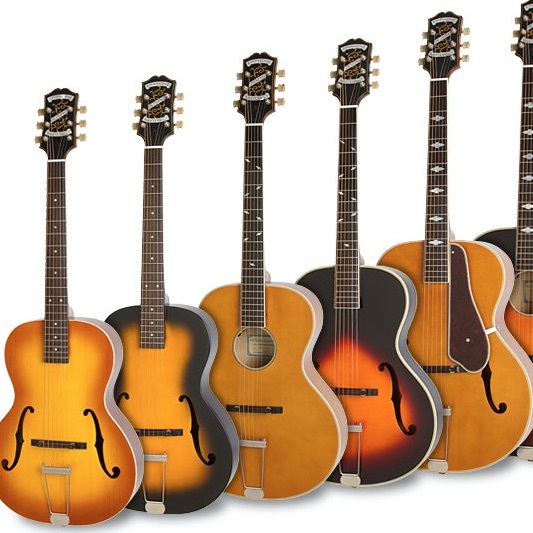 The playability is superb, and the intonation is excellent. These elements add up to making it my favorite guitar. I've used it at jazz festivals all over the world. Speaking of playing all over the world, you are known for having an energetic stage show, something not necessarily common to instrumental music. Where does that come from? Performing is what excites me the most. We try to bring an upbeat, positive, energetic show every night. I really get into it, and try to be in the very moment each time I perform. It is easy to have your mind on other things like catching a plane, finishing a record, or preparing for the next gig. To let it all go, and be 100% committed to the present moment is my goal when I'm on stage. How much of your live show is planned out and how much is off-the-cuff improvisation? For the most part my songs live on stage are similar to the recordings but never the same twice. I always state the familiar guitar melody, but the solos are always 100% improvised. Arrangements often change, too. If the band hits something that is really feeling good, I'll sometimes bypass a section or extend another in the live setting if the audience is digging something. To me personally, I'm not married to the recordings. I respect them, but always try to keep it fresh and exciting. I never use backing tracks behind me in a live performance. Everything that is played is 100% live usually with just a four piece. We heard a rumor that a blues album may be in your future. Care to let us in on what's going on with that? Yes, I've been writing a modern blues record. I hope to have it out within the next year or two. I wanted to document that side of my playing. I was very inspired by the modern blues players such as Larry Carlton and Robben Ford and the way they blended jazz and blues into great tunes that were very accessible to all audiences. This record will have mostly overdriven yet smooth guitar tones. Stay tuned for this one. I'll be using the Sheraton, but will also experiment with the new Epiphone Les Paul Ultra-III on this project. You have taken your playing to a level that many guitarists never attain. What advice would you give to the minor-pentatonic, garage-band player out there who aspires to more? My advice to anyone looking to add dimension to their playing and get out of a pattern/block based approach is to keep a journal. Every time you come across a song, riff, or progression that is different, analyze it in your own way. It can even be a couple notes. Write down what you've discovered. I can remember realizing that a chromatic sequence of B-C-C#-D can work over a G7 chord. Two years later, I figured out that playing simple triads in the key of G also worked. These sounds offer so much more than playing strictly G minor pentatonic scales. You start to figure out the rules of harmony, melody, and then how to bend them here and there to get more interesting sounds. Sometimes, it is just slight adjustments of what you already know that can bring forth new sounds. The psychology of guitar playing and music business knowledge are two areas I think that are completely ignored in standard lessons and even music school education. Yes, you have to learn the instrument, and have a foundation to work from. However if you are going to pursue being an instrumentalist or the path of the blues/jazz guitarist, there are so many things in addition to the music that come into play. It starts with having faith, being patient, and ultimately realizing that what is possible for anyone is possible for everyone. Envision yourself doing what you dream of and then do it. Realize that growing and developing can be challenging at times. Going out and playing in front of people regularly is key. Keep that mental picture alive and nurture your original voice. Don't be afraid to offer what is unique about you, often that is the best selling point. Learning scales, obtaining knowledge, and practicing can only get you so far. At some point a whole set of intangibles comes into play that have nothing to do with music or the instrument itself. What's on the horizon for 2012? In 2012 we have the second half of our "Urban Folktales" tour ahead. We'll be all over the country promoting this new record. We are also planning our first trip to Japan. Lastly, I am also in the initial stages of developing a program for public schools that introduces the wonderful world of guitar to a whole new generation of future listeners and players. We hope to have more info on this very soon. 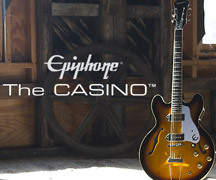 Thank you Epiphone for your support. I am thankful to be part of the family! 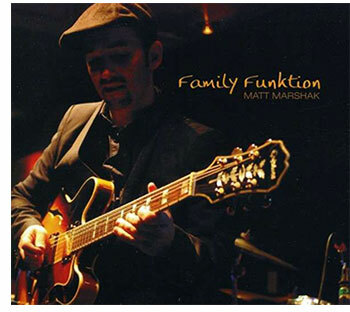 For more information about Matt Marshak, please visit www.MattMarshak.com.